The rapid growth of the smart electronics market and the rising demand for textiles that can be used as wireless sensors are predicted to enhance the growth of the global smart fabrics market in the coming few years. As per the research study by TMR, in 2017, the global market for smart fabrics stood at US$2.2 bn and is projected to reach a value of US$5.5 bn by the end of the year 2022. The market is further anticipated to exhibit a strong 19.60% CAGR between 2017 and 2022. The rising trend of miniaturization of electronic components and the expansion of the application segments for the smart fabrics market in wearables are considered as the important factors that are projected to enhance the development of the market in the next few years. The rising popularity of sophisticated gadgets that are equipped with advanced functions is likely to encourage the growth of the overall market over the next few years. On the contrary, the high cost of products and the technical issues associated with the integration of fabrics and electronics are predicted to restrict the growth of the market in the near future. Moreover, the lack of strict regulations and standards is another factor likely to curb the market growth in the near future. Even so, the rapid development of the key enabling technologies and the growth of the comparatively low-cost smart wireless sensor networks are predicted to offer growth opportunities for the market players in the coming few years. A large share of the global smart fabrics market is expected to be held by North America over the next few years. Also, this region is predicted to lead the market are register a promising 18.50% CAGR between 2017 and 2020. The existence of several leading players and the rising acceptance for new technology is anticipated to support the development of this region in the next few years. On similar note, the Europe and Asia Pacific are projected to experience strong growth in the near future. The rising number of application segments and the rising spending capacity of consumers are further estimated to enhance the growth of the smart fabrics market across Asia Pacific in the next few years. Furthermore, the Middle East and Africa is likely to observe a steady growth over the next few years. The global market for smart fabrics is presently at a developing stage and is projected to witness high growth in the next few years. 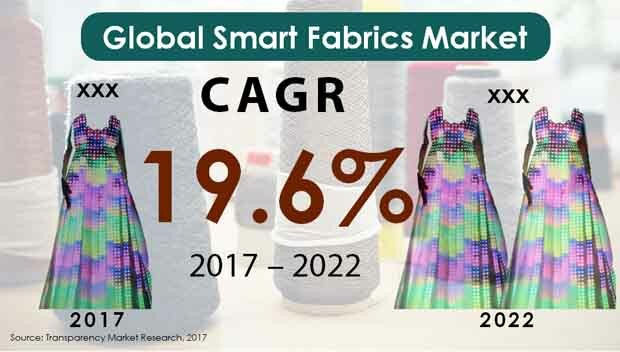 The growing research and development activities and the rising adoption of modernized gadgets are the prime factors that are likely to support the growth of the global smart fabrics market. In addition to this, the key players are spending heavily for innovations and technological advancements, which is likely to offer growth opportunities and attract a large number of players in the coming few years. Also, the rise in the number of mergers and strategic partnerships is predicted to encourage the development of the overall market in the near future. The leading players in the global smart fabrics market operating across the globe are Nike, Inc., Milliken & Company, Adidas AG, Outlast Technologies LLC, and Oneill Wetsuits L.L.C.